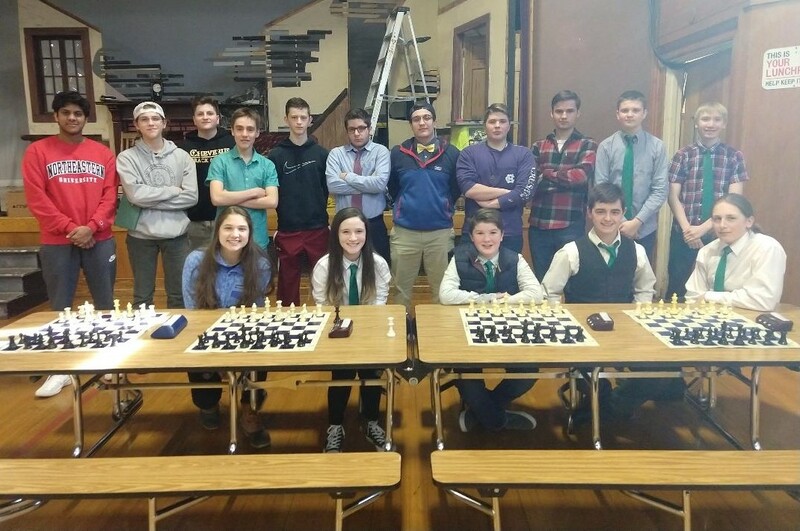 03.01.19 Like the All Saints Winter Warmup, the Southwestern Maine High School Chess Championship tournament is in place as a training tournament for those players who would like to get some chess competition in before the Scholastic Team Chess Championships. The "Southwesterns" were held at Cheverus High School in Portland on Saturday, February 23rd. The tournament had three sections: a six-player rated section and two non-rated sections. The sixteen competitors at the Southwestern Maine High School Chess Championship played on Saturday, February 23rd at Cheverus High School in Portland. Thanks to Phil Lowell, Dan Lavallee, and Oisin O'Searcoid for contributing to this report. Dennis Kalloor topped the six-player section with 2.5 points in three games. Kalloor played Zach Brislin to a draw in round one then went on to win his next two encounters. Trailing Kalloor with 2.0 points in clear second place was Tyler Rodenberger. Aiden Thomas and Isaac Dinnerstein tied for third with 1.5 points. In the non-rated sections, Clara Parker and Marcus Hansel of Cape Elizabeth scored a perfect 3.0 points. Sam Holbrook and Nicholas Bither from Cheverus were undefeated with one tie. Declan Thomas led Bonny Eagle with two draws.